Two warring sisters,one protestant, one catholic vie for the soul of the kingdom. At stake is not only the spiritual future of England but their own lives and everyone associated with them. Can Elizabeth’s spymaster save her from the Tower and his own head from a spike on London Bridge? 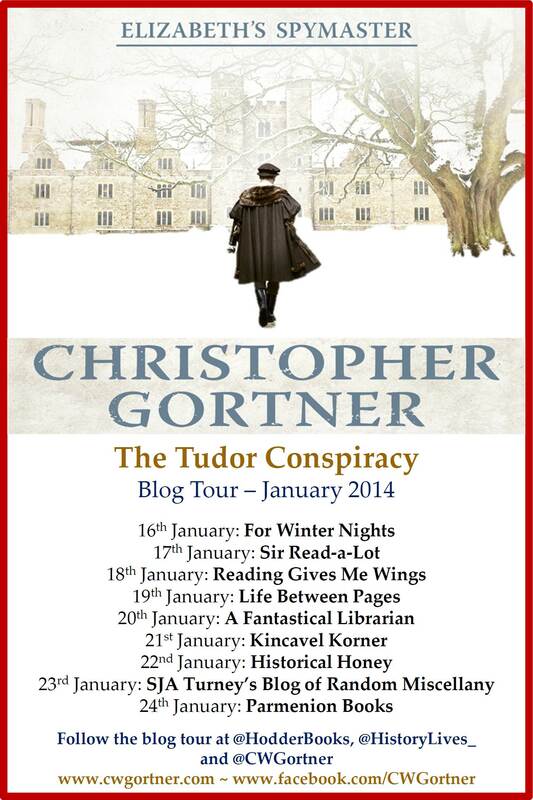 In Christopher Gortner’s, The Tudor Conspiracy we are plunged into the murky world of the Tudor court. I am very pleased to take part in the Blog Tour to celebrate the release of the paperback. You can read my review here. 1) The Tudor period has been written extensively about, both in fiction and non-fiction, what made you set this series there? When I first decided to write a book set in the Tudor era, I did worry about it being over-done, with many excellent writers having covered the era extensively. However, my research seemed to indicate that unlike the reigns of Henry VIII and Elizabeth I, the so-called forgotten Tudors—Edward VI and Mary I— appeared to be less popularized. Likewise, their reigns were fraught with social and cultural changes that seemed ideal for the type of spy adventure I wanted to write, featuring a young man with a secret past who becomes a protector of Elizabeth before she becomes queen, when she faced some of her greatest challenges and dangers without the benefit of her full royal power. The period after Henry VIII’s death and Elizabeth’s accession offered a wealth of situations for my fictional spy to engage with; it was the perfect milieu for Brendan and his friends. 2) How much research went in to this book? Far more than will ever show in the final product! I have been researching the Tudors for many years, so it is almost impossible to quantify. For this particular novel, I did a lot of extra research into Mary’s reign and events surrounding the Wyatt Revolt, as well as less-accessible research into the sexual mores of the era, the types of entertainments—tawdry and otherwise—available at the time in Southwark, as well as a comprehensive exploration of Old London Bridge. Research for any historical novel takes years, so I was fortunate to have a solid foundation to build upon. More importantly, for me, as well, is researching the emotional and psychological aspects of my characters, in order to understand how they saw and interacted with their world. I try to balance my fiction with the realities of life in the time, to show the underside of the glamour we have come to associate with the Tudors. Television shows and movies depict a far less grim world than it actually was. Death was an ever-present concern, whether from disease, injury, or as the result of a lethal gambit at court. People lived much closer to the edge, which I think lends fascination to the era. 3) Queen Mary is known to history as ‘Bloody Mary’ but you write her sympathetically, was this a deliberate ploy or came from researching her? Mary became a monstrous tyrant through experiences she had; she was not born one. This was a queen who came to the throne relatively late in life, after having endured a traumatic adolescence and embittered young womanhood. She cleaved to her Catholic faith both in her mother’s memory and in defiance of those who tried to browbeat her into submission. Faith became an integral part of her being, almost like a defense mechanism. It hardened her personality, leading eventually to the obstinate and often terrifying woman we meet in the book. I also wanted to show her innate compassion toward those she believed were loyal to her, her human need to feel loved and sense of time slipping away, as well as her relentless drive to vindicate the past. Good people can do terrible things; Mary is one of those. 4) Elizabeth is one of the most famous and well-known monarchs in English History, was there anything you read about her that surprised you? I think what I find most surprising about Elizabeth is her chameleon-like ability to adapt. She was truly a survivor. She learned very early in life that trust could be fatal and managed to sidestep numerous attempts to destroy her. She had this flexibility, like a well-honed sword; she knew when to play the odds and when to hide and pretend she knew nothing. She constantly surprises me because she is so unpredictable. I can imagine that serving her at court must have driven her attendants mad at moments; she rarely allowed anyone close enough to know her true heart. We tend to reinterpret Elizabeth according to our times; she remains endlessly interesting because as legendary as she is, she continues to exert this enigmatic hold over our imaginations and her own cleverly constructed mystique. 5) In all of your books you write about young but very strong women, how do you get into their heads to understand their ambitions and fears? This is tough to explain, really, because the process is so innate, almost organic. The easiest way to say it is that despite gender differences, we all experience the same emotions. How we experience and interpret them may be unique, but love, hate, desire, guilt, betrayal, ambition, sorrow: these emotions are universal. I also employ an acting technique, in that I strive to “become” my character. The reader should find themselves within the character’s mind and heart, not mine. I am only a conduit, if you will, for the story that my character wants to tell. I write about women from the past whom I rarely agree with; in many ways, I am their antithesis, a man of the 21st century who does not share their world-view. Yet in order to portray them, I have to let go of who I am in order to discover who they were. As a writer, I must disappear entirely so we can hear the character’s voice. Research plays a significant part, as well, of course. By reading everything I can about my characters, I begin to get a sense of whom they might have been in life—what they liked and disliked, their strengths and weaknesses, their fallibility. As with any other character, fictional or not, as the writer you must know them as intimately as you do yourself; you have to anticipate how they will react to any given situation in order to make them believable. I obviously do not subscribe to the adage: “Write what you know.” Because before I started writing my books, what did I know, in truth, about living in the 16th century? I do believe, nevertheless, in studying your subject until you do know it – as well as you know your own era. For example, when your character turns to the wine decanter, you should know if the wine has dregs; if it is warm or sweet, red or white; if your character even likes drinking it or is using it as a means to distract, seduce or persuade. You may only write, “I turned to pour wine,” but the fact that you know what kind of wine it is, as well as a myriad other details about your character, will give you the confidence to live within their skin for however long it might take to tell their story. 6) Which authors/writers inspired you to start writing? I have written since I was a boy. My mom remembers me making up stories and illustrating them in spiral-bound notebooks. I believe writing chooses you. It’s not an easy or gregarious way to make a living, if you ever succeed at getting paid to do it. Certainly, there are less difficult professions. I did, however, become enamored of historical fiction in my early years after I was introduced to the work of Jean Plaidy, Alexander Dumas, Daphne du Maurier, and Rafael Sabatini. I read voraciously as a child; I still do. Books create for me a special magic that no other artistic expression does, and historical fiction in particular can clothe the skeletons of the past in hues of flesh and blood, bringing history to life in ways that I always find enthralling. 7). Can you describe your ‘typical’ day writing? I’m usually at the computer by 10:00 in the morning, and after answering e-mail for a half-hour or so, I revise what I wrote the day before and then plunge in. I have a set daily goal of 2,000 words. Sometimes, I write more, sometimes less, depending on the day. I do write every day, however; I also set aside a few hours in the evening to read – other books, not my work. Reading is as essential for writers as writing, because when you read other writers whom you admire, you learn. For me, the important part is to get the first draft out. The excitement comes later as I revise and deepen the story. 8). If you could give one piece of advice for aspiring authors what would it be? Persevere. This is such a tough business, with a lot of disappointment. You must want to be a writer more than anything, because writing entails sacrifice. Before my books sold to a publisher, I spent most of my free time writing before or after work; I had to forgo time with friends and family, shopping, etc. If you cannot deal with the demands on your time and subsequent rejection, often quite a large amount of it, being a writer is probably not your best option. You must also learn to accept criticism and realize when a project is ready for an agent and, conversely, when it is not. Not every book will find a home or even success after publication in today’s extremely volatile marketplace. Yet every manuscript we complete is an added lesson in our craft. Writing is like any other art form; only through constant practice can we become what we dream to be. This entry was posted in Blog Tours, Interviews and tagged Christopher Gortner, Mary Jane Grey, Queen Elizabeth, Queen Mary, The Tudor Conspiracy. Bookmark the permalink.